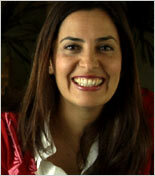 Soraya Salti is the Regional Director for Injaz Al-Arab, based in Amman, Jordan. The organization works in 12 countries throughout the Middle East/North Africa region to pair private-sector volunteers with schools in order to bring entrepreneurial skills into the classroom. Injaz is based on the Junior Achievement model, a U.S. based organization with affiliates in 98 countries. Soraya worked to “arabize” the curriculum and grew the program to serve over 120,000 thousand students across the region. Here she talks with FRONTLINE/World reporter Amanda Pike about the youth unemployment crisis in the Middle East and Injaz’s efforts to help solve it. FRONTLINE/World: How did you realize that unemployment was such a big problem in the Middle East -- that Injaz was really necessary? Soraya Salti: When you walk around, you see youth everywhere -- we’re a young population. In 2003, there was really a profound moment because the World Bank issued a very important report. It said the demographics were creating a youth bulge and that the Arab world would have to create 100 million jobs for new entrants into the labor market. So it became a critical issue then, and everyone become aware -- ministries of education, governments -- that if you don’t pay attention to the youth and their employability, this could be a really big burden on society. Injaz Regional Director Soraya Salti with Reporter Amanda Pike. And then all of a sudden it becomes today, 2008, and the big issue of the Arab world is: What do we do with our youth? So it's been an awakening. Even with corporations for example -- marketing campaigns of corporations never addressed youth. And in the last two to three years, all of a sudden you see the banking sector with big marketing campaigns to get youth as future customers. And you see telecoms trying to get youth as future customers. In 2001, this did not exist whatsoever. They were just not paying attention, even though we knew that 70 percent of the Arab world was under 30 years old. What does that mean for the region? This is the Middle Eastern North African region, so it means that either these youth become a burden on our economies or they become an engine for growth and prosperity. In the West for example, it's the complete opposite. These youth are 70 percent of the Arab world -- are they going to become productive members of society? Employed and generating wealth for our economies and raising the standard of living? Or are they just going to be a burden on infrastructure, a burden on resources. If they are unemployed, it means that they have no ability to form families, to become independent as individuals. How bad a problem is unemployment in the Middle East? The unemployment issue, across the region, is a youth unemployment issue. For example, here in Egypt, you find 83 percent of the unemployed are youth. And when I say youth, it's between the ages of 15 to 29. If you go to Jordan, it's 30 percent. In Algeria, it's 40 percent. Even in oil-rich countries like the United Arab Emirates, where you used to have the biggest economic boom, 32 percent of youth are unemployed. They were on the sidelines, observing others prospering while they were unemployed. Saudi Arabia -- you’ve got 35 percent of the youth unemployed. So across the region, it's a youth unemployment issue that is the crisis. 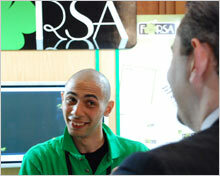 Nour Rafaat, an 18-year old pharmaceutical student and one of the competitors in the Company Competition. From what you’re saying, this is one of the most serious problems facing the Arab world. How do people in general feel about it? You walk into any household and you ask the kids in schools, “What’s your biggest concern?” And they say, “Well, to be able to find a job one day. My brothers are unemployed. My aunt is unemployed. My uncle is unemployed.” So you really feel it, and the stress of it is a big burden. There was a big survey across the region, with 1.4 million youth participating; 88 percent felt that they would not be able to find a job. And 70 percent blame government for it. So when you look at the demographics, and you say 70 percent of the Arab world is youth, and 70 percent of the youth are blaming government for not being able to find a job, then where is this anger going to go? And that’s the scary part of it -- when you have youth who are educated and unemployed. What will they do with their lives? It sounds like a national security issue for a lot of countries? Absolutely. The economic well-being of the youth is a national security issue of every Arab country. Historically speaking, governments were the ones responsible for the employment of youth, and the education system catered to that assumption. So education systems are focused on rote memorization, and students are completely isolated from the surroundings of what’s happening today. They’re completely isolated. It's all studying the past, taking exams and then expecting a government job. Well, the skills that they have are only good enough for a government job. So when government is not employing them, there is frustration and anger. And you see education attainment increasing across the region, but the more educated our youth have become, the more unemployable they have become, because the education system is not meeting the needs of the private sector. Ahmed Youssry makes his sales pitch. When we look at Egypt, and especially Cairo -- Egypt being the most populous country in the Arab world, and Cairo, I believe the most populous Arab city -- it seems kind of like a microcosm of what’s going on in the rest of the Middle East. Well, Egypt is by far the largest country in the Arab world and, each year, you have 850,000 new entrants to the labor market there that need jobs. The World Bank said that the Arab world has to create 100 million jobs -- 20 million to solve the current unemployment and 80 million for new entrants into the labor market. So this statistic predicted that by 2020, 80 million jobs would have to be created for the new entrants. If you take a look at the current size of the labor market across the region, you have 54 million jobs that exist today. These 54 million jobs took 50 years to create, and, in less than 15 years, we have to create 80 million jobs for new entrants in the labor market. The country where the youth unemployment is most severe is Egypt, because you have 22 million youth today between the ages of 15 and 29. And amongst the unemployed in Egypt, 83 percent are youth. From what we’ve read, a lot of these young people graduate, and they’re waiting 2, 3, even 6 years, to find a job? Well, for 75 percent of Egyptian youth, it takes them five years until they get to their first job. What are they doing in these five years? They’re just hanging out at home and on the streets, unable to graduate into adulthood, to have self-respect and dignity. And it seems a little counterintuitive, but these unemployed youth are actually primarily middle class, college graduates? About 30 percent of Egyptians go on to university, and to get into university is a very tough ordeal. You’ve got to pass some very serious exams to actually make it into the university system. And because the historic perception is that government will employ a university graduate, Egyptian households have invested heavily in private tutors. So, overall, you find that 40 percent of students across Egypt have private tutors, and by the time they get into secondary schools, 60 percent of Egyptians have private tutors. The thinking is, “If my kid makes it into university and I invest every single penny that I’ve got to get that kid into university, they will be employed by government.” And this is the biggest misperception today: that by the time they graduate from university, they will be the most employable students in the economy. And you find 83 percent of university graduates unemployed today, waiting five years until they get their first job. There is a complete mismatch between what the university and education system is graduating and what the private sector is saying we need in skills for us to be competitive in this global economy. How can you be competitive in business if rote memorization is how you made it through 16 years of education, if you’re just memorizing facts and disconnected from critical thinking? When all of these young people across the Arab world can’t get jobs, what does that mean for them? There was an interesting report in 2003 that said whoever controls the youth and their minds are the ones that are going to come out winners in the end. And is it going to be the government that controls the youth through the education system? Or is it going to be fundamentalists, who are right there waiting for them? And if you find a youth who is unemployed, hanging out, who’s going to be the one that takes their hand and says, “I’m there for you”? It sounds like it could become a kind of lost generation of disaffected youth who, as you said, can’t graduate into adulthood. This generation of youth, a generation of unemployed youth, has been marginalized from even the best of scenarios, which we saw, when we had the biggest economic boom in my lifetime -- the oil boom that was taking place in 2007 and early 2008. Even with an economic boom, the issue of youth unemployment was not resolved. So, what does it mean? It means that even in the best case of scenarios, youth are marginalized from an opportunity to graduate into adulthood and to become independent, self-respecting human beings who are just able to do the normal things in life, like getting married and having a home of your own. Instead, we see youth still living with their families and with their parents at the age of 30 and 32, and delaying marriage and just frustrated with the reality of their existence, and lined up at every foreign embassy, looking for an opportunity to migrate elsewhere. This is not a place where they want to stay. They want to migrate, whether to an oil-rich country, or whether to America, or to Europe. How is Injaz trying to be an answer or response to this problem of youth unemployment? The youth need to understand what the private sector wants from them so that they can find meaningful employment there. And what we’re trying to tell the private sector is to send their staff members into schools to transfer their knowledge from the private sector directly into the classroom across public schools, across the region. Then there’s this bridging that can take place, so that schools and students at a young age can start to understand the demands of the private sector and what’s required of them, and can start working toward those skills that the private sector sees as necessary. The second point that’s important is the changing of the mindset. Students see role models walking into the classroom, successful employees of corporations or business owners, showcasing a model of success to these students, and also giving them an equation for success. What we’re trying to tell them, and what the private sector is trying to say, is that wealth creation is a simple equation. It’s called entrepreneurship. If they can learn how to become entrepreneurs, just like they know how to read and write, then we are putting their futures into their hands. Instead of becoming dependent on government, and dependent on society to take care of them, they’re empowered to become self-actualized individuals in the entrepreneurial realm. You believe entrepreneurialism is the answer to some of this youth unemployment? Yes. In every economy, it is small and medium-sized enterprises that generate about 70 to 80 percent of the jobs. So with the demographics that we have, and with the youth unemployment that we have in the region, clearly it's not existing companies and corporations that are going to be generating the new jobs, especially because it's just such a huge amount of jobs that need to be created. Egypt alone needs 850,000 jobs each year. So if we put that aside and say it's not going to be coming from companies and it's not going to be coming from government. It must come from entrepreneurship. It must come from students having the skills to start their own companies and to take destiny into their own hands. And with the support of micro-credit organizations that have expanded across the Arab world, then at least we have an equation for success for them. Then we can start moving forward. Can you describe to me what this competition is, the competition to be the best student company? We want to create excitement and generate an inspiring model for youth to become entrepreneurs, and what’s better to do that than create a competition? So we’ve implemented Junior Achievement’s 90-year-old program. Funny enough, Junior Achievement started in the Great Depression, when youth were graduating into unemployment, and it was this social entrepreneurial idea to say, “Well, if we teach them how to self-employ and create entrepreneurial ventures, then they can stand up on their own feet.” And today we find ourselves in a similar equation. So we send private sector volunteers into their classrooms, across public schools and public universities, and these private sector volunteers become their mentors over a semester. Over a 15-week period, they start a real-life company. They come up with an idea. They do a feasibility study. They divide into management teams. They elect their student CEO and president of the company. So it's a laboratory of self-exploration, enabling the students to see where their strengths are beyond taking exams. And then we bring in CEOs from companies to assess their performance as small, medium-sized enterprises and judge them and tell them exactly where they went right, and where they went wrong, and then declare the student company of the year, for Egypt and also for each country across 12 countries that we’re operating in. This year’s regional competition will be in Lebanon, so they were all competitively striving to go to Lebanon. Most of them have never exited their country. And now, here’s an opportunity to take their entrepreneurial venture to the next level and compete with students across the region and see who will win for 2009 for the Arab world’s best student company of the year. And what does it do for the students, beyond just teaching them skills? What does it do for them personally? The students are so oppressed in the environment they exist in. In schools, they are just recipients of information, and in their households, it's a patriarchal society, so it's the father always saying “Hush, be quiet, get out of my way.” They’re probably one of seven, if not one of ten kids in their household. No one is listening to them. No one is there saying, you know, “What do you think? What do you think about life? What do you think about your future? What do you do every day? What excites you?” So, they’re kind of left alone. Then all of a sudden when you captivate and inspire them, the Junior Achievement Injaz program becomes their way to let out this cooped-up energy that they have and channel it into a positive direction that in the end becomes an investment in their own future.